Noise from A/C fan coil and compressor units is disturbing. Fan Coil units and other ventilation components can generate noise levels that are unacceptable in many home and work environments, creating a distraction and adding to stress levels. Noisebar Acoustic Lagging for Ductwork. Easy to cut and install, NoiseBar5 combines industrial grade loaded polymer barrier with soft acoustic absorption foam to minimise noise breakout from ventilation equipment. 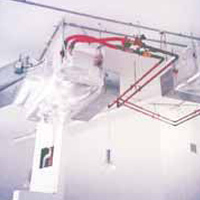 Applied externally to the equipment casing or laid on the ceiling below a suspended unit, NoiseBar 5 forms the core of a quick and inexpensive system that really works. Sound reduction index;- Rw63, C;Ctr -2,-7 single wrap over duct. Roll sizes: 3000mm x 1350mm wide. Accessories: Fit using insulation pins with perforated base plates and washers. Reinforced aluminium foil tape used to seal edges and joins. May 2008 test results available on request.